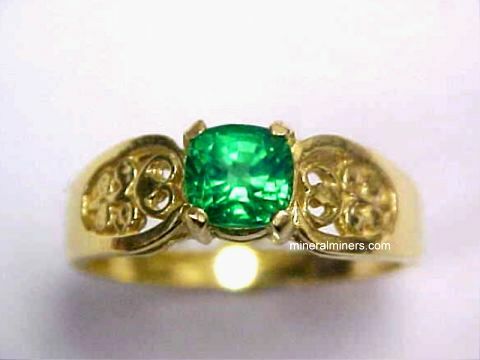 Try our Natural Tsavorite Green Garnet Ring Satisfaction Guarantee - compare our prices and our superior quality. 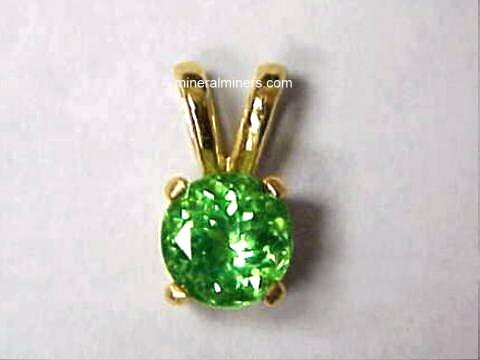 Click on any Tsavorite green grossular garnet ring image or Merelani Mint Green Garnet Ring below to enlarge it. This 14k yellow gold green tsavorite garnet ring is set with a natural tsavorite garnet gemstone weighing 1.32 carats with very fine dark green color (100% natural color - this tsavorite garnet gem is unheated and untreated). This beautiful gem is eye clean, and it was very well cut with excellent brilliance from a natural green tsavorite garnet that was mined in Kenya. This 14k white gold tsavorite garnet ring is set with a natural tsavorite garnet gem weighing 0.98 carats and with 4 natural white diamonds weighing 0.22 carats total weight! 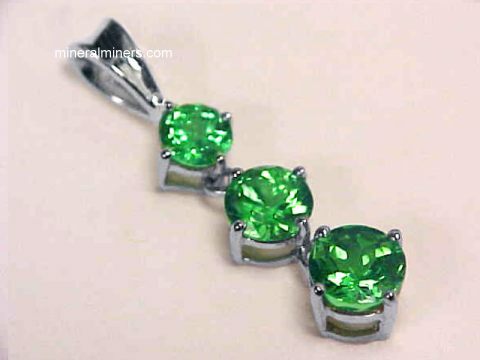 The tsavorite gem has fine dark green color (100% natural color - this tsavorite garnet gem is unheated and untreated). This beautiful tsavorite gem faces up eye clean. It was faceted from a natural green tsavorite garnet that was mined in the Taita Hills of Kenya. See also another view of this natural color tsavorite garnet ring. This PLATINUM tsavorite garnet ring is set with a natural tsavorite garnet gem weighing 1.87 carats and with 2 natural VS, G-H white diamonds weighing 0.40 carats total weight! The tsavorite gem has fine medium tone, bright green color (100% natural color - this tsavorite garnet gem is unheated and untreated). This beautiful tsavorite gem faces up eye clean. It was faceted from a natural green tsavorite garnet that was mined in the Taita Hills of Kenya. See also a side-view of this natural tsavorite garnet ring design. The total overall weight of this PLATINUM ring is 6.86 grams. See also another view of this finely crafted 14k gold tanzanite jewelry design. Our Green Grossular Garnet Rings page displays natural color Tsavorite Garnet Rings & natural color Merelani Mint Green Garnet Ring designs set in 14k white gold and in 14k yellow gold. We also have fine mandarin spessartite garnet rings available, along with other natural spessartite garnet jewelry designs. 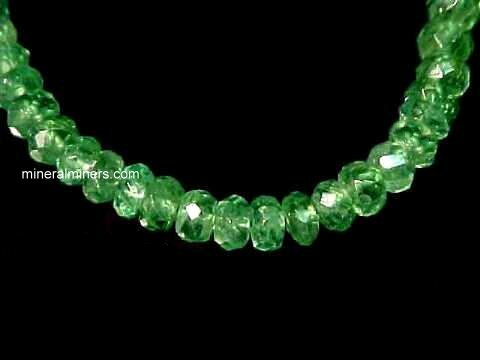 See our selection of natural tsavorite green garnet crystals. 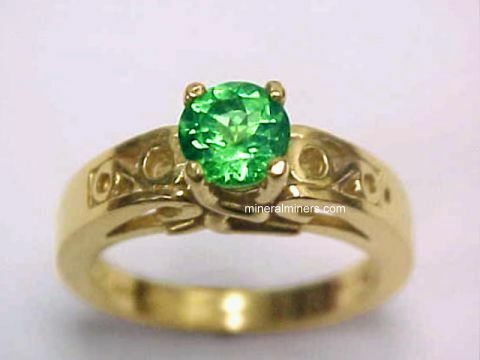 Below you will find links & information for genuine tsavorite green garnet rings. We have several different sizes and shapes of tsavorite green garnet gems set into 14k gold rings with lighter color Merelani mint green garnet rings and also some deep green tsavorite garnet rings. Each one of our tsavorite rings is set with natural color green tsavorite garnet gemstones. Our tsavorite garnet gemstones are unheated & untreated! We have tsavorite garnet rings available with tsavorite gemstones faceted into round cuts, ovals, pear shapes and trillion cuts. Our tsavorite rings are set in solid 14k gold. We have them available in both the lighter mint green natural colors and also in the rich deeper green natural colors, all with 100% natural green tsavorite garnets that were mined in Tanzania and Kenya. For more information about natural tsavorite garnet and its history, physical properties, chemistry, occurance, and metaphysical uses be sure to see our garnet information page. 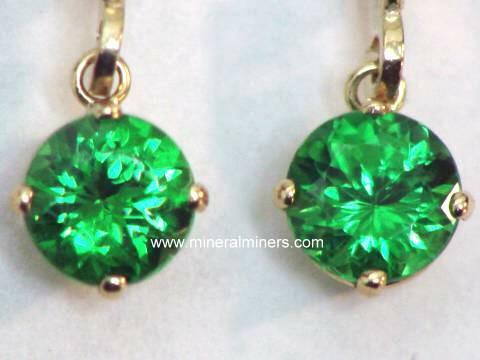 Be sure to see our page displaying genuine Tsavorite Garnet Gemstones. To see more natural tsavorite green garnet photos, just select another item category from the table below. See also our page displaying all of our garnet rings. To see photos of another mineral variety, select any item category link in our Mineral Inventory & Factsheet Index. Would you like us to inform you when we add more natural color Tsavorite garnet rings (natural green grossular garnet rings) and Merelani mint green garnet rings? We do have additional inventory of natural color green grossular tsavorite and Merelani mint green garnet rings in stock with a variety of tsavorite gemstone shapes and sizes, so be sure to let us know if you have any Tsavorite or Merelani green garnet ring requests. Please contact our webmaster or our 'site' geologist with any questions or comments.